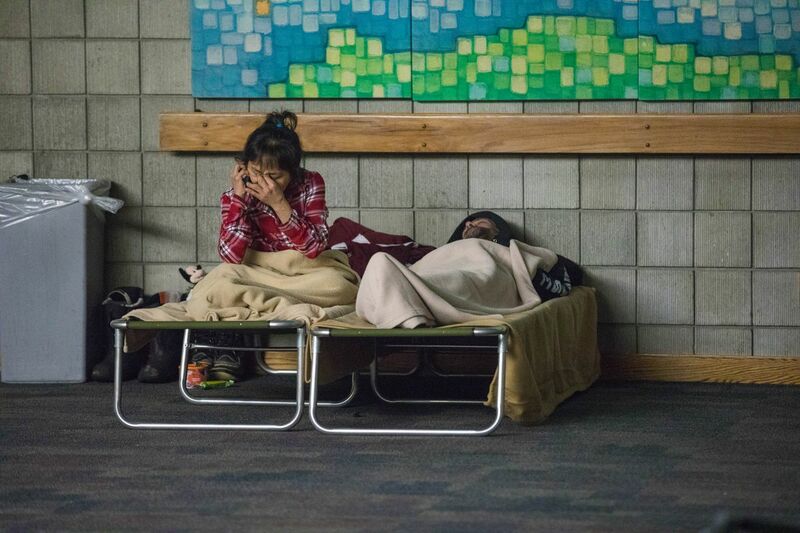 Dozens of survivors took shelter Wednesday at a recreation center in Spenard after an early morning fire ripped through their 30-unit apartment building, injuring 16 and killing two of their neighbors. 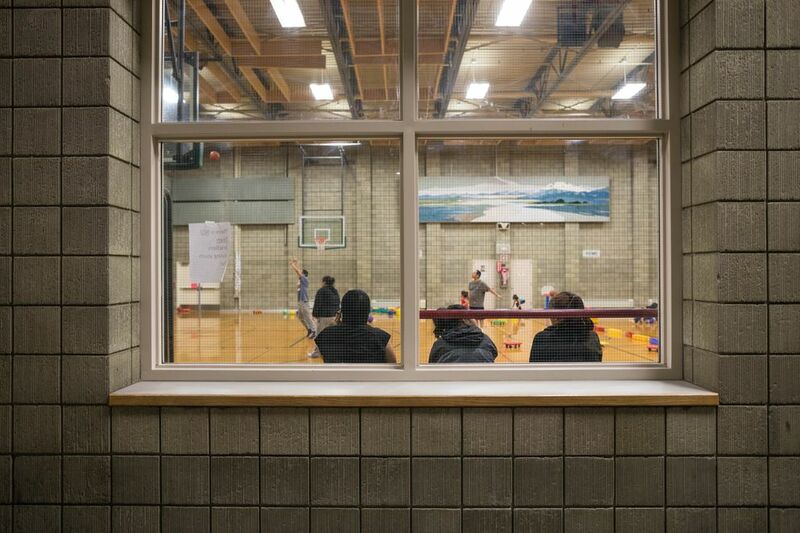 Some of the displaced Anchorage residents gathered in the gym, sitting on bleachers while kids played basketball. 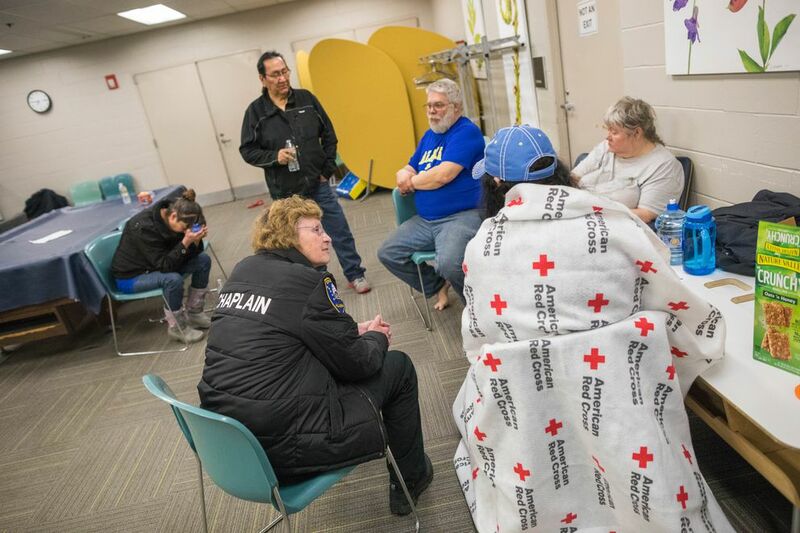 Others slept or talked on the phone on cots set up in a nearby room as a police and fire chaplain moved through, quietly consulting with survivors. The fire at the Royal Suite Apartments, located off Minnesota Drive not far from the Spenard Community Recreation Center, moved fast. It was first reported to the Anchorage Fire Department around 2:20 a.m.; residents described a chaotic scene as they awakened to find their homes burning and had to flee in a matter of moments. Robert Miller, who lived in a third-floor apartment with his wife, said that he awoke to the sound of fire alarms but was not seriously concerned because of false alarms at the complex in recent weeks. AFD records list two recent false alarms at the building, one Jan. 26 and a second on Thursday. "We thought, 'Here we go again,'" Miller said. "I woke up, I heard screaming, I opened the door — I saw flames stretching all along the hallway." Miller — barefoot, in a blue T-shirt and jeans — said he and his wife escaped with only the clothes on their backs. "We're literally running ahead of the fire; the fire was above our heads," Miller said. Resident Brieanna Brooks, wearing a nightgown, slippers and a coat at the recreation center, said she jumped out of her first-floor apartment window to escape, which took just over a minute. She said she was choking on smoke as she fled. Other people jumped from higher floors trying to escape the flames, both Miller and Brooks said. AFD Operations Chief Jodie Hettrick said some were injured in the course of the evacuation, though she declined to elaborate. The fire was under control by about 5:15 a.m., nearly three hours after it was first reported. Minnesota Drive between Tudor and Spenard roads was closed for a time as more than 30 AFD units responded to the blaze, which left one end of the apartment building a ragged, blackened mess and turned cars parked nearby into warped husks of metal. Brooks said she heard cars exploding during the blaze. "My car is literally nothing but just a blob of melted metal," Brooks said, indicating its remains were only waist-high. 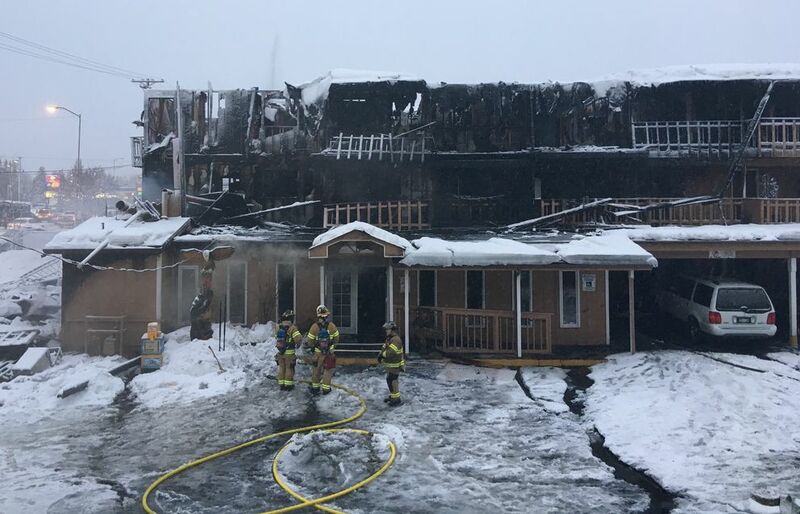 As the sun came up on the devastation Wednesday, wet snow collected on the remnants of several cars parked in front of the burned-out building. A few firefighters examined the west end of the smoldering structure, occasionally pumping water into doors and windows. Peter Douglas Sr., who lived in a first-floor apartment with his wife and four children, said his son woke him up and they hastily evacuated. "Our alarm didn't turn on and it usually does," Douglas said. "It was a real big fire and that was all I saw — I heard screaming." Douglas said he was thankful to be alive but had a sense of guilt following the fire. "I feel that I should have done more, you know — I pray that it didn't spread too much, I pray for the firefighters," Douglas said. "We've got some lost that I'm hurting for and praying for." News editor Ben Anderson contributed to this report.